Yahoo has taken all of the viral features of the most popular messaging apps and combined it into one monster of a service called Livetext. Livetext lets users text each other while conducting a video call -- with a catch: There's no audio. The thought is that the presence of audio can sometimes prevent people from responding to video chats right away, but they may still want to see one another while texting. It's a risky bet and Yahoo (YHOO) is targeting young users who may want to talk to a friend during boring dinner parties with a little more interaction than just text. Like Apple's (AAPL) FaceTime, there's no limit to how long conversations can last. You can use the front and rear facing cameras. You currently can't add additional media files or send links. 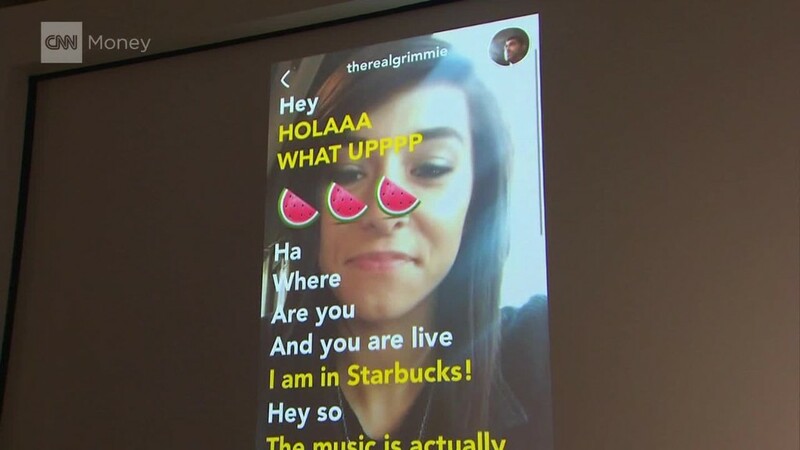 Livetext displays text messages and emojis on the video screen like Twitter's (TWTR) Periscope, doesn't save or archive chats and media files like Snapchat, and organizes contact lists and friend requests like Snapchat too. The group of friends you've contacted most recently appear as avatars, organized like Facebook (FB) Messenger. The app will launch Thursday for users in the United States, United Kingdom, Germany and France on Android smartphones and iPhones. It's already live in Taiwan, Hong Kong, and Ireland. Yahoo has lacked a powerful messaging app as it has tried to bulk up its suite of mobile services. Like most other tech companies, Yahoo is looking to rely increasingly on mobile products to make money. Adam Cahan, Yahoo's head of video, design and emerging products, told a group of reporters on Wednesday that the company won't try to make money through the app until it reaches a reasonable number of users. At the end of the second quarter, 20% of Yahoo's revenue came from mobile. It reported 600 million monthly active mobile users, and total sales from mobile was up 55% from last year. While Livetext offers many of the best features from lots of different apps, its late entrance will make it harder for Yahoo to convince people to download and use yet another mobile messaging platform. And eventually, it may not even have its hallmark trait to rely on to hook users. When CNNMoney asked Cahan if the app would ever allow video chatters to turn audio on if they wanted to, he said no, because users shouldn't have to worry if audio is accidentally on. But, he added: "Never say never."